Making connections between disparate but related concepts is critical to understanding the world around us. The Radix Endeavor, an MMO-style game based on math and biology systems, was designed to get students recognizing and thinking about those connections. Beyond math and biology content, it aims to engage students in deep thinking and problem solving, putting them in a situation where they have no choice but to figure things out on their own. They do that by making connections within the game world, which in turn leads to connections that reach out into the world of the classroom and beyond. Engaging in the inquiry process and making these discoveries results in ideas that resonate far beyond the time spent in front of the computer. Although it may seem counterintuitive, this kind of connective deep thinking does not commonly emerge in formal school settings. On the contrary, the sentiment in this chapter’s opening quotation unfortunately endures in many classrooms today. Knowledge is imparted and procedural skills are taught, but creative, independent, and deep thinking is more rare. There are certainly pockets of good thinking going on, such as when individual teachers go out of their way to foster “curiosity of inquiry” and make space for it in their classrooms. Even the occasional school will take on the challenge of integrating “alternative” pedagogies such as constructionism or project-based learning. But the reason they are not more widespread is that they are just that—alternative pedagogies—in an educational system that doesn’t currently value inquiry and deep thinking, at least as expressed by the measures it uses. The lack of these types of learning in practice is not because of an inability or an opposition to implementing them, but rather because of external factors such as limited time, mismatched assessments, and unsupportive stakeholders. The pockets of deep thinking that are happening and the positive response they get demonstrate a pent-up demand in teachers and students to be able to engage in inquiry learning. Resonant games, being situated, integrated, and student driven, can help create this type of learning experience—one that provides the context, motivation, and scaffolding to get students doing the hard work of thinking for themselves. One of the key ways Radix supports this goal is by enabling students to make connections between what they have done in the game and other experiences in the outside world. Doing this means students have to identify patterns across contexts and apply concepts in multiple ways, which is a type of thinking students are not often challenged to engage in. These connections between the game, the classroom, and the world may take a wide variety of forms. For example, Radix has a stool tool which lets players examine animal feces to see what they contain. A class of biology students played the game and figured out that they could use this tool to examine glumbug droppings and understand the glumbug’s role in the game’s swamp ecosystem. Later in class they read articles about various ways in which scientists analyze prehistoric animal dung to learn about how creatures like woolly mammoths died out. In this instance, the game enabled them to have an authentic experience with the scientific inquiry process, while providing a foundation for a wider view of how those techniques can be applied in the real world. As another example, students at the Museum of Natural History played the genetics quests in Radix, getting practice identifying inheritance patterns and understanding how a fictional plant’s genotype determines its phenotype. Then in lab they had the opportunity to explore genes from another angle, learning to do DNA extraction and identify the genotypes of real plant matter they collected themselves. This gave them two different entry points to explore the ideas in genetics and compare what the game let them do with what they could do in the lab. Finally, a group of afterschool students used the trait examiner to discover all the creatures in the Radix world and catalog their traits and which varieties they found. Then as a creative extension, they were challenged to come up with their own creatures, design a variety of plausible traits, and explain why the creatures may have developed those adaptations. This activity got students to think more deeply about animals and adaptations beyond the game, bringing in prior knowledge and motivating them to do their own research. These are just a few examples of how game play in Radix can be tightly connected to activities outside the game to create a deeper and more long-lasting learning experience than either activity on its own. Backing up a bit from how the Radix game-play experience facilitates connections and deep thinking, we should also look at how the game was designed to enable these connections, and how the implementation was designed to foster them. We started from within the game, designing an authentic, though fictional, world, populating it with rich species and characters, and providing a set of exploratory tools. Along with the game’s narrative and quest tasks, these elements set the foundation of students’ in-game experiences. We purposely provided opportunities to probe complex systems and independently make discoveries that, while unique to the game, were also meaningful and transferable to the real world. In addition to designing the in-game experience, though, we also worked to design the experiences surrounding the game. Classroom implementation includes a complex array of factors, such as location, timing within the curriculum, requirements, pedagogical approach, social facilitation, transfer activities, and so much more. We designed resources, implementation plans, and professional development sessions to help teachers customize an implementation that was best for their classes while supporting the core goals of the Radix project. Beyond the classroom, we also worked further outside the game, taking into consideration the larger ecosystem of schools and districts that the game would be functioning within. This ecosystem and the relationships within it are depicted in figure 5.1. As much as we may wish that a great game and a great teacher can make great learning, the reality is that those components exist within the larger education system, and learning experiences need to be designed to function within those constraints. Figure 5.1 Resonant games interacting with each layer of an educational ecosystem, including the classroom, school, district, and society. Before delving into the details and examples of these design principles, we’ll first present an overview of the Radix world and game-play experience, along with the educational content embedded within it. Massively multiplayer online games (MMOs) are a genre of game that consists of open worlds that encourage exploration and experimentation. Learning in these environments often involves hypothesizing, probing, observing, reflecting, and adjusting strategies before trying again (Gee, 2003). Typically in a game of this genre, players find themselves in an unfamiliar virtual world but equipped with an array of tools and in-game abilities. They are presented with a series of tasks, often called quests, that set specific goals but don’t tell the players exactly how to accomplish those goals. To progress, players must experiment with the tools at hand to see how they can interact with the world and its inhabitants. Through this process of experimentation and discovery, they construct an understanding of the world’s underlying systems and how to work within them to accomplish their goals and complete quests. 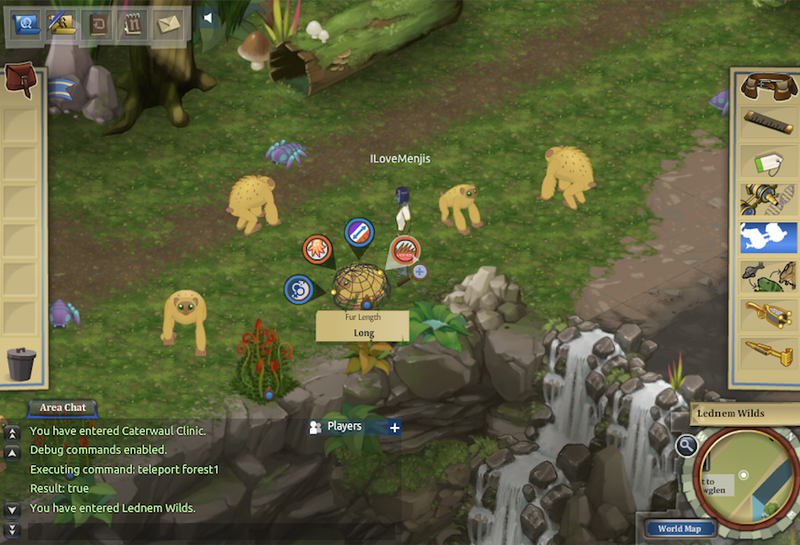 While in the world, players in an MMO can see the avatars of other players nearby and are commonly motivated to chat with each other to give each other advice or even collaborate on quests. The unique affordances of massively multiplayer environments have been shown to foster scientific thinking, scientific identity, and inquiry skills both inside and outside the educational gaming space in games like Quest Atlantis, Whyville, and River City (Kafai et al., 2010; Barab et al., 2007; Ketelhut, 2007; Ketelhut et al., 2007; Nelson et al., 2007). The open-ended game play encourages a deep engagement in exploring systems and models, relying on the process of evaluation and argument to build knowledge (Steinkuehler & Duncan, 2008). To capitalize on the affordances of MMOs and to build on the commonalities between this type of game and authentic science inquiry, we set out to design The Radix Endeavor as an environment that deeply integrates STEM practices as core game mechanics and allows players to learn by doing in authentic contexts. To support these goals, the Radix game world is designed around systems that players can interact with and manipulate. 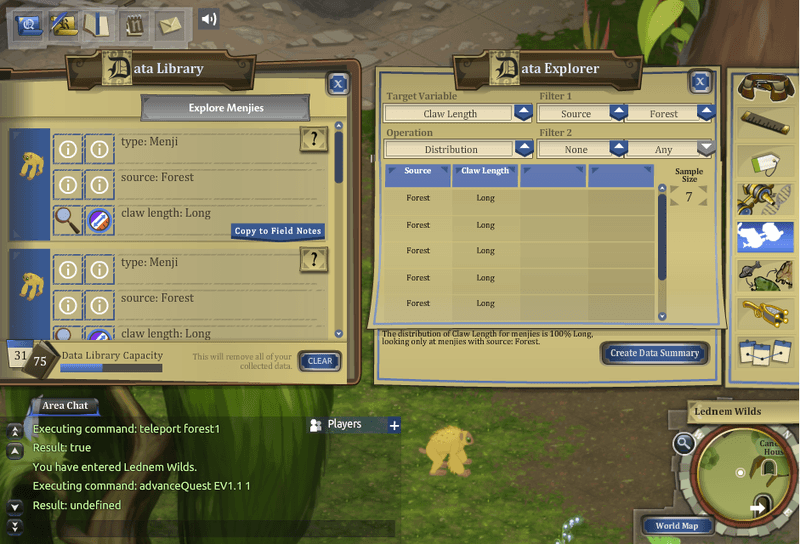 Figure 5.2 shows players in the forest region, one of the five distinct biomes with unique fauna, flora, structures, and characters. In each of these biomes, players can engage in activities such as collecting data to compare the heights of plants in different regions. They can also experiment with running simulations to see how a species in a biome has evolved over time and manipulate variables to test out changes in the environment, as seen in figure 5.3. Players also have various tools that allow them to engage in the authentic practices of biologists and mathematicians. Some of the tools are open ended and creative, allowing players to draw geometric objects on scale maps, build fences, or create and share food web diagrams. The game play is centered on quests that target specific content areas in biology and math. These quests are designed to encourage players to explore the different systems and biomes as well as to engage in inquiry, problem solving, and collaborative learning in order to complete the task and provide evidence needed to support their solution. Figure 5.2 Radix players exploring the forest biome. 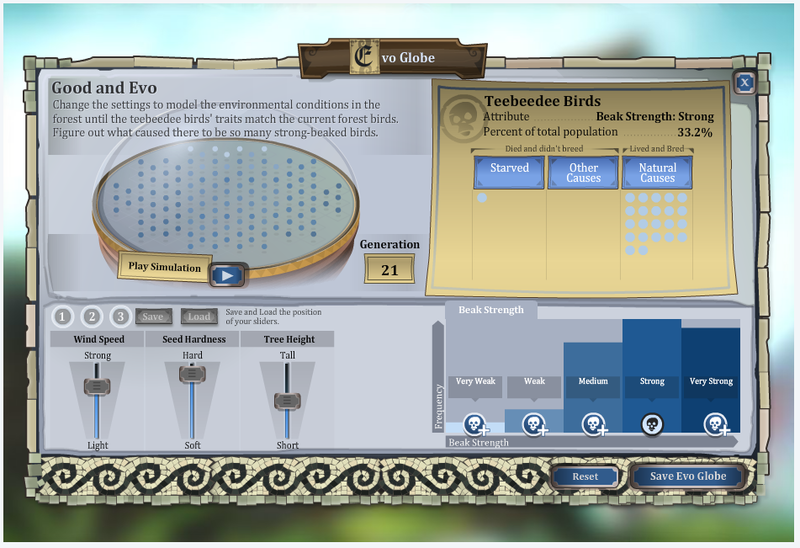 Figure 5.3 The evo globe, which lets players simulate changes in a trait over time. When a new player enters the Radix game, she finds herself in a grassland biome on the island of Ysola, an Earth-like world full of fictional plants and animals. She is likely to see the avatars of other players moving around the world working on tasks in the same area. There is a character nearby with an exclamation point over her head, so she talks to her to take on her first challenge, which starts the series of introductory quests. Once she has completed those quests she will be familiar with navigating the world, talking with in-game characters and using the basic tools for collecting objects, examining them, and analyzing data about them. From there, a wide array of other questlines is unlocked. The player can explore any topic area she is interested in or the specific ones that her teacher has asked her to work on. Each questline starts with one of the island’s residents explaining some problem or question that is causing the people trouble. This way, the game’s challenges are situated in a contextual narrative that gives the player a reason to care, and a motivation to solve problems that will save the island or its people. The player will then use her tools to explore the environment, ostensibly “messing around” but in reality experimenting and making discoveries. Through collecting and analyzing data, the player gains an understanding of the mathematical and biological systems embedded within the game world, such as Mendelian genetics or evolution. Once she understands each system, she can adjust the inputs to that system to get the outputs necessary to solve the problem. She then returns to the character in need of help to turn in an artifact or explain a solution, which requires not only an answer but also data that explain how she knows the solution will work. Quests take place across the Radix world in rich biomes, with different tools becoming useful in different domains. This brief overview provides a sense of the format of the game and the player’s experience, setting the stage to next understand how STEM content and practices are built into the inquiry-based play style of Radix. The virtual Radix world provides an environment where students can gain both content knowledge and the skills and practices critical to science understanding. The game covers four topics in biology—genetics, ecology, evolution, and human body systems—along with three topics in math: algebra, geometry, and statistics. These content areas were carefully selected to complement what students might be able to do in hands-on labs or activities, with simulations and longer time-scale tasks that are possible only in a virtual world. The particular content for each of the topic areas is aligned with standards from the Next Generation Science Standards (NGSS) and the Common Core state standards, including an emphasis on math and science practices. Throughout all the questlines in the game, players must use twenty-first-century skills such as collaboration and critical thinking to solve problems. This emphasis on skills and practices is critical to students as they engage in deep thinking in any domain, and Radix provides an innovative place for students to apply these skills. One of the key components in designing the game content and quests was to create a space where students could practice inquiry. This means that when players encounter a problem in the game, they must think through how to solve the problem and determine their own course of action. To illustrate this process and the type of game play Radix provides, we examine in detail an introductory evolution questline. The initial set of evolution quests in Radix were designed to guide players through a sequence of learning experiences that would fit together to build a larger picture of how evolution works. It starts out with a more guided format, giving players a fair amount of direction in terms of where to go and what data to collect. As players work through the quests, they are presented with more open-ended simulations and artifact creation tools. This design is a common way for MMOs to scaffold a new player’s entry into the game, and it is also a useful strategy for scaffolding the development of players’ data collection and analysis skills. An overview of the progression of evolution quests is presented in figure 5.4. While this shows a linear progression of quests, they do not always work that way. Certain questlines have more branching or varied quests served up to players. In addition, as players work through any questline, they are free to explore other areas of the world they find interesting, and they are also able to pick up and complete quests from other topic areas along the way. This means that skills and strategies players develop in each quest can affect their play patterns in any other questline, and they may interweave different experiences in this way. In this section, however, we focus on the evolution quests and identify the key learning activities as we present this sequence. Figure 5.4 Progression of the first evolution questline. The evolution questline starts with players talking to Dar, an NPC (non-player character) who works for the ruler of the island, maintaining his menagerie of animals. She tasks players with discovering all the different kinds of menjis on the island and helping her collect one of each type. So players wander off to the forest to get started. They know they’re supposed to find a characteristic trait but not which one that is. When they arrive at Lednem Wilds, players find a pack of menjis and figure out how to use the trait examiner tool, as shown in figure 5.5. After the first couple, they get the idea that they can discern the different claw lengths, fur lengths, and hand shapes on each menji. In addition, when they examine these traits, a record of each one is saved to their data library. So players realize that by examining a large quantity of menjis, they should be able to find out whether there’s anything the menjis all have in common. Figure 5.5 Examining menji traits in the forest. For many players, the uncertainty of which trait they’re looking for and how to answer the question posed to them can be frustrating. This is a normal response, especially from students who are used to being asked straightforward questions that have a clear path to the correct answer. The uncertainty of figuring out how to research a fairly general question, however, is exactly where the value of inquiry learning lies. Players are placed into an authentic context, where they have to explore and experiment—there is no specific method given to them to tell them exactly how to find out the characteristic menji traits of the region. The next step of the quest involves data analysis and pattern finding. After examining a good number of menjis (usually ten or more), players may already notice a pattern emerging. They see that menjis have different kinds of fur and hands, but most of them seem to have long claws. If players haven’t been keeping track, they can discover this by organizing their data with the data explorer, a very simple data analysis tool. Players try selecting a few different traits as the target variable until they find one that shows a distribution with a clear majority—claw length! Now even if they already figured out that forest menjis have long claws, they have a data summary report to prove that finding. For players that aren’t familiar with calculating means or filtering by an attribute, the tool helps guide them through the choices they need to make. This tool lets them “mess around” until they find a summary that provides meaningful evidence of a certain pattern. The use of the data explorer is one area where we’ve seen players greatly benefit from using each other as a resource and collaboratively making sense of how to use the tool effectively. Once they understand the tool, they can create a data summary, such as the one in figure 5.6, which shows the percentage of each variety in a population within the selected trait for the data collected. In this case, it shows that finding a forest menji with short claws is very unlikely; in fact, there isn’t even one in this sample. This is what players have already experienced by exploring menjis using the trait examiner, but they then use basic math in an applied context as another way to talk about their discovery. The exploratory act of figuring out how to use a tool to accomplish a goal can be illuminating and satisfying—for many players, even as satisfying as finding the answer—because they have taken ownership of the entire discovery process. In addition, the act of creating a data summary, a piece of hard evidence for what they found, reinforces the importance of being able to back up their discoveries with data. These elements make up a valuable learning experience around independent exploration, an authentic part of doing real science. Figure 5.6 Using the data explorer to analyze menji data. Once players have collected a long-clawed menji for the menagerie and created a data summary to prove its characteristic trait, it’s time to look for the other special menjis. 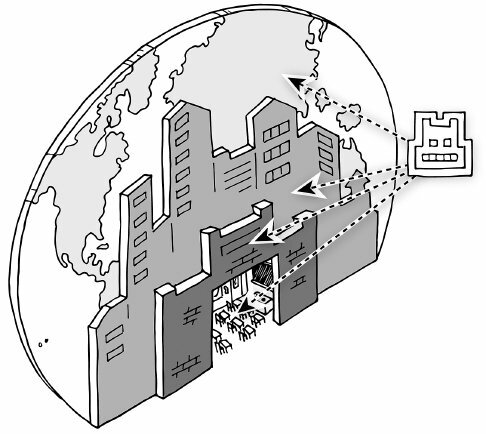 They search the world for menjis and find large enclaves in the grassland (figure 5.7) and in the city (figure 5.8). Now that they have identified a data collection and analysis method, they apply the same principles to discover that grassland menjis almost all have long fur, and city menjis almost all have narrow hands. Figure 5.7 Menjis in the grassland. Figure 5.8 Menjis in the city. While it often takes players significant time and discussion with peers to figure out the forest menji quest, the grassland and city quests invariably go much faster. Repeating a similar task helps players practice identifying similar patterns and build confidence in their data analysis. It also provides the time to begin to reflect on what each discovery means on its own as well as what they have in common. After exploring the menji populations and successfully delivering the results, the last step is for players to explain what they have seen. When they return to Dar to deliver the menjis to the menagerie, she asks why the vast majority of forest menjis have long claws. During their travels, players have talked to Clawphur (figure 5.9) and found out that menjis eat jumples and cloud nuts, which grow high up on trees, and that they use their claws to climb trees. Based on this information, they should be able to report that menjis with long claws could reach the food while menjis with short claws may have starved to death. With this, the questline is complete! 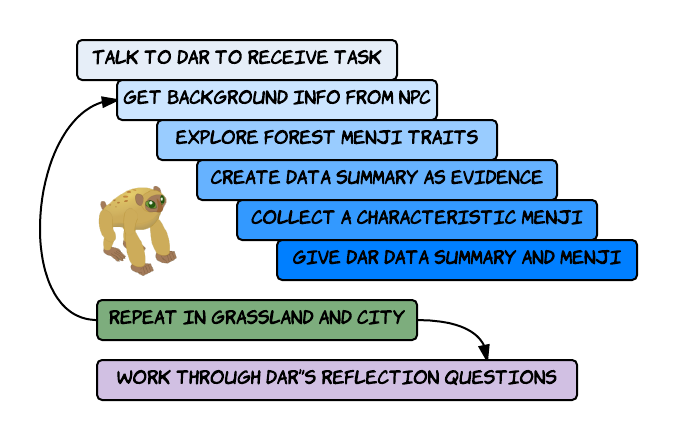 Figure 5.9 A forest NPC providing information on menji behaviors. 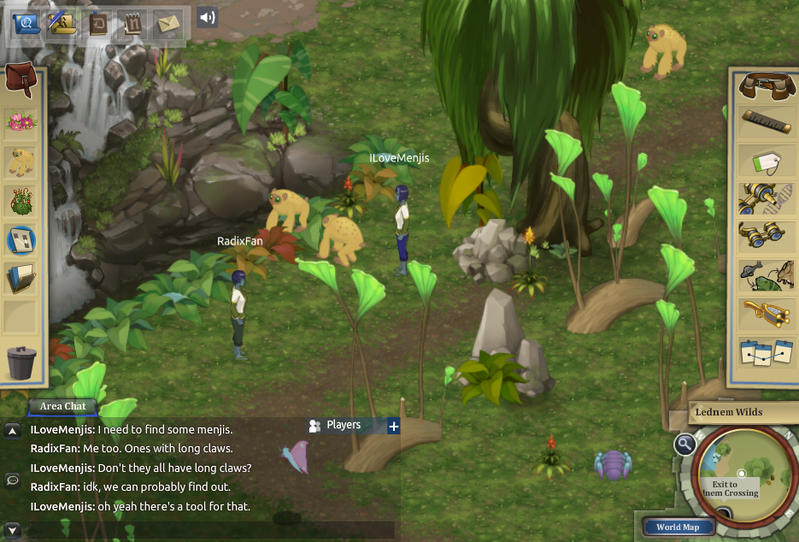 By gathering similar information in each biome, players can begin to hypothesize about models of traits in a population. Dar’s guiding questions help solidify their mental model of why certain types of menjis survive in certain areas while others don’t. With data-backed evidence for the geographic trait differences, and hypotheses that can explain them, players have carried out a research study and engaged in authentic scientific inquiry by the time they have completed this questline. Games based on systems with interesting relationships that provide meaningful choices for players necessitate experimentation as well as analysis and interpretation of the outcomes. When a game includes systems made up of interesting relationships, players get an engaging experience of experimenting and making discoveries. They can try things many times and get slightly different results, necessitating the use of their analytical and interpretive skills. A game without interesting systems often falls flat, with outcomes becoming fairly predictable regardless of what choices the player makes. While they are not necessarily bad games, they tend to require less deep thinking, appropriate for procedural content knowledge but not so much inquiry learning. One of the key elements in creating a game space that supports inquiry and deep thinking is designing interesting systems. These should be systems that have a set of meaningful relationships, often mapped to a real-life system, where the players have some control over the inputs and must evaluate the desirability of the outputs. Usually the rules of the system are not all known to players when they start, so they must experiment and hypothesize about how the system works. Once they get the outcome they want and can reproduce it consistently, they have constructed a deep understanding of the relationships within that system, which is a valuable learning experience. Each topic area within the game of Radix has a system embedded in it that models some real-world concept. The genetics system of inheritance patterns is an example of this with a very clear mapping. Plants and animals in the game have traits, and there is variety within those traits. 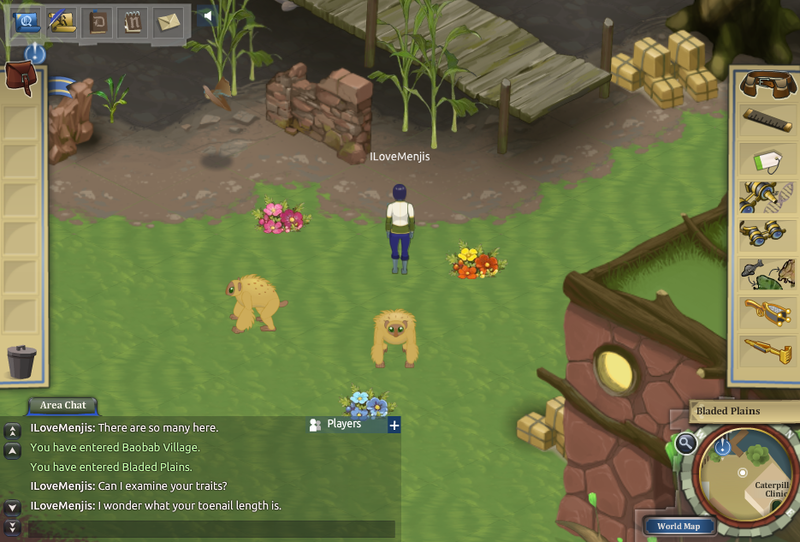 Using tools provided in the game, players can examine each organism to identify its phenotype (outward appearance, such as flower color) and its genotype (alleles for a specific trait, such as Aa). When investigating a new species, however, they don’t yet know which varieties are dominant or recessive, or even which inheritance pattern applies to a given trait. Based on the information they can obtain, players then use the breeding tool to mate two individuals and breed some offspring. The game runs its simulation of the possible resulting traits and randomly chooses from those for each offspring. Next, the player examines the individual offspring as well as views some statistics on the traits of the brood as a whole. By comparing what they bred and what offspring they got, through a handful of crosses, players can deduce how alleles interact for a particular trait, and therefore how the inheritance pattern works. The process of probing a system to understand it is embedded in the quests students work through. In one of the genetics quests, players must help a character find enough glumbugs to make his glummy cakes. The problem is that some glumbugs are toxic, and players must find a way to reliably get large quantities of nontoxic glumbugs. It’s clear that breeding them is the way to go, but the question is which glumbugs to collect and cross. So players examine glumbugs and conduct experiments, keeping track of which type of parents produce which type of offspring. Once they figure out that nontoxicity is a recessive trait, and once they have bred a generation of homozygous recessive bugs, they can then breed large quantities of nontoxic bugs for the baker. In this case, the bugs with certain genotypes are the inputs to the system, and the offspring (hopefully nontoxic) are the outputs. The system of relationships is built into the breeding tool, which models the complete dominant inheritance pattern, following the rules of Mendelian genetics. Working with a meaningful system in this context gives players the opportunity to create their own mental models and test them out, using inquiry skills and engaging in deep learning. This is very different from the way many students learn Mendelian genetics in schools, where they follow a procedure to fill out a Punnett square but don’t always see it in the context of a larger system. Having students themselves make the connection between the way recessive traits work and actual organisms that have those traits is one of the benefits of building meaningful systems into a game like Radix. While the genetics system is clearly modeled off an existing biological system, others in Radix may not exist in reality as they do in the game. These fictionalized systems are designed to create a context in which the application of the concepts become clear. The algebra questline is one of these: in a marketplace that doesn’t accept currency, players must instead barter with the merchants. At the beginning of a quest players are given a trading kit with some starter objects, and at the end they can trade for gold bars at the pawn broker. The merchants don’t all have the same perspective on the value of each object, however, and that is where the mathematical thinking comes in. If players start with three sizzgams, they must compare all the things they could buy with those sizzgams, and then compare all the things they could buy with whatever they now have, essentially testing out a trading path through the trades merchants make available. In addition, they have to evaluate for themselves where they need to end up. To obtain the most gold bars possible, they may take one path, but to maximize one type of object, they may take another path. In the algebra marketplace, the inputs are the trades players choose to make, and the outputs are what they ultimately end up with when they are done trading. The relationships in the system are the options given by the vendors and the broker, which determine what players can ultimately get out of the system. While there is no marketplace in the real world that functions in exactly this way, designing such a system let us create a space where players need to think about concepts like unit conversion, multistep problems, and quantitative reasoning, and apply those skills to reach their goals. This shows how a mathematical system can deepen both a learning experience and a game experience. The breeding tool and the algebra marketplace are systems directly tied to STEM content and quest tasks, but there are also systems designed into Radix that support learning indirectly by making the exploration gameplay experience more authentic and interesting. This is the case with the trait distribution system that functions in the Radix world. As you walk around any biome, you encounter plants and animals whose traits you can examine. Game designers and content writers came up with each species, trait, and variety that can be found in the game, but they also specified the distribution of each variety across regions. As each creature is generated, their varieties of each trait are assigned randomly but according to probabilistic parameters. This means that the designers also had the opportunity to specify the distribution of each variety in each region, for example dictating that on average 80 percent of menjis in the grassland have long fur, and only 20 percent have short fur, whereas in other biomes, it may be 50/50. This particular trait distribution is at the heart of the evolution questline described previously, where players discover the concept of natural selection by finding out that certain varieties are more prevalent in certain places. In this system, the inputs are the distributions specified by game designers, the relationships are the manifestation of those distributions in creatures’ traits, and the output could be said to be players’ discovery of those relationships. This type of behind-the-scenes system can be powerful in making a game feel alive and in creating a rich world of exploration. In addition, well-designed game systems are versatile, often becoming useful in multiple ways. The trait distribution system in Radix enables certain quest mechanics in evolution, ecology, and statistics, as well as providing a rich and authentic context for players to freely explore. This feature helps students make connections across disciplines and understand a concept at a deeper, more abstracted level. Complex systems are a valuable tool in educational games, but they are also prevalent in commercial games, which we can look to for inspiration when designing for learning. Many MMOs have an auction house, which at first glance may appear to be simply a location or tool but in reality is a rich economic system. Players earn or create objects, which takes time, skill, or both. They can then sell those game objects to other live players, who bid using an auction format. Different objects may be more or less valuable to different players depending on their progress in the game, or their chosen path through the game. So supply and demand comes into effect, the auction house is alive and ever changing, and players must carefully make decisions that will affect their subsequent game play. This type of game system was one influence for the design of the Radix marketplace, which despite being single player, also challenges players to think about how to determine the value of their objects. Another well known systems-based game is SimCity. The original SimCity, along with its multitude of sequels and spinoffs, was at its core a system of relationships among elements of a city. Players make decisions and see what happens to their citizens’ wealth, happiness, and other metrics, and by doing these experiments, they figure out something about how the game’s city works. Some of those relationships are intuitive: if I add an amusement park, my people will be happier. But others may take more probing: if I build a nuclear power plant, how will that affect the neighboring residential zones, and in turn, how will those changes affect the residential zones across town? Players form hypotheses about how the simulation works, and they can test those hypotheses with the inputs they have access to. On a larger scale, players may even extrapolate some of these questions to the real world when they notice urban planning issues in their own communities. While SimCity was not a great model of urban planning, it did give people a vocabulary and curiosity to ask those questions. The city’s relationships could certainly be more accurately modeled in a version whose goal was for players to understand realistic urban communities by playing the game. This potential for making connections among systems within the game and out into real life is something that learning games can capitalize on for both presenting content and practicing more generalizable skills. Regardless of the complexity or subject of a game’s systems, when they are robust and explorable, they make a game feel alive and drive the imagination of the player. The flowers you might breed in your first generation affect the flowers you can breed in subsequent generations, so it is more complex than a simple virtual experiment. Finding large blackburn birds in the desert doesn’t mean you can assume they are large everywhere, and interacting with the system is what opens your mind to those possibilities. A robust system is not easy to design, but it doesn’t necessarily have to be complex. Many interesting game systems are simple and elegant. The key to designing them is to recognize that the game experience becomes compelling when the models are rich enough to actually experiment, not simply input something and get out an answer. Consequently, that’s when the experience of probing the system will stick with the player and help make connections in systems even outside the game. Social experiences are an integral part of learning, as we discuss in chapter 4. Opportunities for social interaction were provided in Vanished by designing challenges that required collaboration to solve them. Opportunities for social interaction are also provided in Radix, but through the design of the tools in the game rather than the design of the tasks. The goal of including these features was to contribute to the inquiry-style learning environment being created. One fundamental feature of MMOs, including Radix, is that players walk around the world with their avatar, and as they do, they can see other players’ avatars as well. This makes the world feel alive and can create a sense of community. Often if a whole class is in the same region during a class period, players know who the other players are. Other times, they may be students from other classes or other schools, but depending on the permissions set, they can use in-game chat to talk to each other. 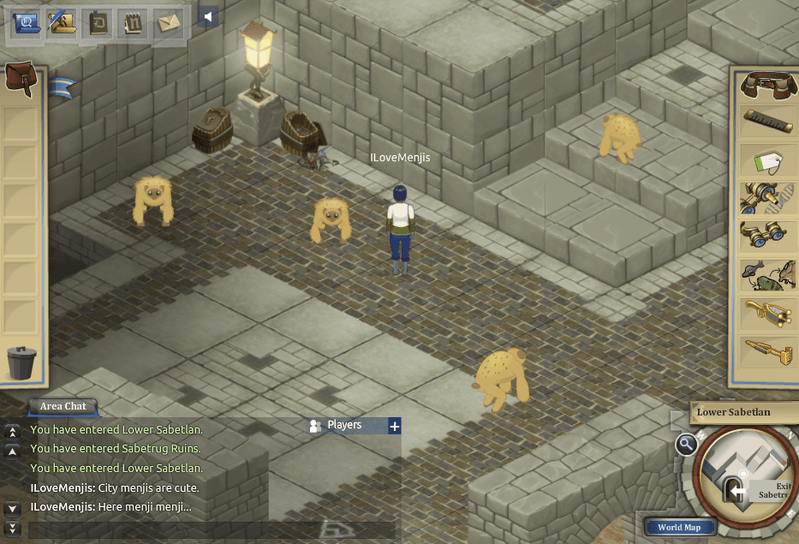 The chat is open ended and therefore doesn’t direct players’ conversations, but when they meet in the same area, say, the marketplace, they may guess that the other player is also working on algebra quests and strike up a conversation about how far they’ve gotten and what strategies they may be using. Similarly, once players have added each other to their buddy list, they can send each other in-game mail, including attached objects. This means that if I forgot to collect a jipsnout with a certain trait, and I’m now halfway across the world, I can ask a friend to catch one and send it over to me. Additionally, if I find a crazy new species in the swamp, such as a plaid schloggen, I can send one to my friend to share my new discovery. This type of social feature is designed to enable players’ communication about quests and possible collaboration, without requiring them to engage with each other. One of the more robust social features in Radix is the ability to “party” with other players. In typical MMOs this means players can form a group with a private chat channel, with many types of accomplishments shared across members. This enables groups to complete a task with less work for each person, or to achieve goals that would be too difficult for any individual player. In Radix, the partying feature centers on data collection. When a player examines the phenotype, genotype, or any other attribute of a species, that data is stored in his data log for him to analyze later with the data explorer tool. When that player is in a party, data that his fellow party members collect is also automatically stored in his data log. This means that he can carry out studies with larger sample sizes or that cover more geographical area. Many players have also discovered that it meant they could ask someone to collect certain pieces of data for them if they didn’t want to walk over to that specific spot. In Radix this means that the work players can do in groups has a different quality than what they can do on their own. So even though quests don’t force them to party, when they decide to try it, they may start thinking about the problem in a new way. Additionally, providing these opportunities for collaboration necessitates communication. When players want something specific, they need to use accurate language to describe the traits they are looking for or how many data points they need from each area. Collaboration and communication are important skills that students in classrooms aren’t always called on to practice. The approach used in Radix to help build those skills is to embed opportunities for social interaction directly into the game play. The multiplayer functionality currently built into Radix is content agnostic. That is, these features don’t apply to any one topic area—they are equally useful in a genetics, evolution, or geometry quest. They are also not essential to completing quests in the game, which can all be finished by a single player. While there are reasons we built the first version this way, there is huge potential for other multiplayer experiences that tie directly to discipline-specific practices. For example, players might need to collaboratively draw up plans for a set of buildings, contributing to the same scale map. They would need to agree on a scale, split up the measuring of the buildings, and draw them on the map to the correct scale and in the correct place in relation to other players’ buildings. By using the same shared map, they could check each other’s work and give feedback on which spots may not be to scale. 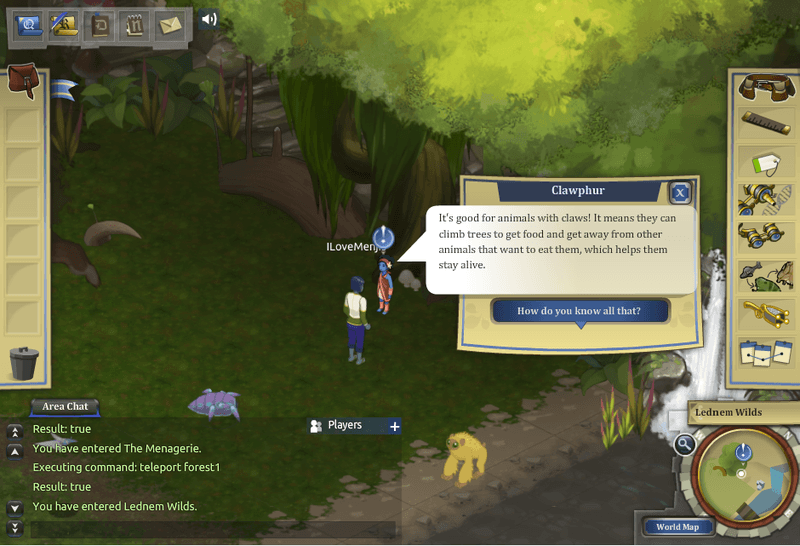 Another example is on an ecology quest, players might have distinct responsibilities that complement each other. So one player might need to reintroduce a species into an ecosystem, while another player breeds more of that species, and yet another monitors the effects on other species in the relevant food web. Tools would be designed for these specific purposes that also facilitate players’ collaboration and integration of their ideas and contributions. By engaging with these social experiences embedded in content-based tasks, players would need to think on multiple levels about how to do their jobs, what other people need to know to do their jobs, and how to ensure that everyone’s contributions work together. Running up against the different ways in which other players approach a certain task can be eye opening, but it is not something that happens often in individual learning experiences. A rich game world with well-designed challenges provides a safe space to make those different approaches visible and then work to integrate them into a solution collaboratively. This type of deep learning experience not only improves understanding of STEM concepts but also leads players to think in an open-minded and connected way. Well-designed games or software can be tools to both spark and sustain those valuable social interactions. Skills and practices, not only content knowledge, can be taught within games in unique ways. Drawing out these goals explicitly in bridge curriculum activities can build on and solidify the learning. A game with meaningful ties to the curriculum, in terms of not only content knowledge but also skills and practice, provides a starting point to make connections to other activities. Thoughtful bridge curriculum builds on the game to create a rich array of extended learning opportunities. When a game’s curriculum is in a more informational or procedural style, opportunities to make meaningful connections outside the game are limited. It becomes difficult to design quality bridge curriculum that goes beyond practice problems and gets at complex concepts. Radix was primarily designed for teachers to use with their classes in schools. We were careful to make it accessible to players outside school as well, but many of our design decisions were driven by a vision of how the game would be implemented in classrooms and incorporated into existing curricula. It is a large game with a lot of content, and it is designed to be played at multiple relevant points throughout an existing year-long curriculum. Students may take a little time to become familiar with the game and its pedagogy, but they keep coming back to it, playing for a week or two each time they come to one of the units included in the game’s curriculum. From the outset, the vision was that the bulk of students’ game-play time could take place outside class, when they were free to experiment as much as they liked and explore whatever areas of the world they were interested in. They could work at their own pace and not worry about how far the student next to them had gotten, while still taking advantage of the social features to communicate with others working on the same quests. Once students had had this personalized but shared experience working with the content, teachers could use in-class time to conduct activities that facilitate transfer, go deeper into certain concepts, and explicitly make connections to other related activities or topics. This approach builds on the concept of preparation for future learning discussed in chapter 3, in which having the game-play experience doesn’t mean you’re done learning; rather, it is just the beginning—setting a foundation on which future instruction and experiences can be built. The game’s curriculum is tied to the Next Generation and Common Core standards, with the most important tie being the skills and practices laid out in the standards and embodied in the game. In science these are things like modeling, scientific inquiry, and data analysis; in math they include optimization and problem solving. Although these practices are being given more weight in the standards, it is often not made clear how teachers should teach these skills that don’t fit into a traditional procedural teaching approach. Games, especially ones that provide rich experiences, are one way to put students in a situation where they can practice those skills. Yet when it comes to both content and skills, completing a questline in the game does not imply that players will have discovered the meaning of adaptation or the idea of optimization all on their own. Some players who have prior knowledge of these terms do make connections, becoming cognizant of what phenomenon they are witnessing. For most students, though, it takes some additional activities to reflect on the game experience and generalize it to a broader context. The use case for these activities can be compared to the field trip model that is common in schools. The value of a field trip is clear—students get to visit an authentic site, such as a zoo, history museum, or research science lab, and see things they don’t usually get to see in person. They often have the opportunity to do hands-on explorations and talk to experts, engaging with material in ways they can’t do in the classroom. To make the most of these firsthand experiences, students are often given guides or worksheets to complete while at the field trip site, which can help organize their thinking and situate their observations within the context of what has already been taught. Additionally, a thoughtfully integrated field trip will include related activities that take place back in the classroom. These activities may extend the learning or synthesize what students saw and connect it with larger concepts from the curriculum. Of course, because of time constraints and planning limitations, teachers don’t always have the opportunity to carry out these kinds of activities. But it is easy to see that if learning ends when the field trip ends, there is a missed opportunity to deeply integrate hands-on experience with classroom learning. Similarly, games can be considered the hands-on experience after which learning should not simply be considered finished. Like field trip experiences, the learning in game experiences can be built on and magnified by closely integrating them into other class time. We saw this occur through Labyrinth materials that provided additional opportunities to apply the math concepts from those puzzles. Given the importance of this model, when Radix is used in schools a heavy emphasis has been placed on discussions and activities outside the game. Some of these activities were designed by the Radix team and provided to teachers; others individual teachers designed themselves to make connections to materials used in their own classes. We often call these activities bridge materials, because they are meant to bridge the game experience to a more formal learning experience. Regardless of who designs that bridge curriculum, the critical idea is that these out-of-game experiences must be thoughtfully designed and implemented. Class discussions are one of the most basic, and yet underutilized, ways to solidify learning that can happen in a game or other hands-on activity. Facilitating a discussion in which students recap what they did and reflect on how the experience went can be very powerful. Often when a game is played during class time, however, the bell rings and the students leave, and the next day the teacher has to move on to the next topic. So class discussions don’t always happen, but when teachers plan time for one, they can do a lot to help students make explicit the phenomena they explored in the game. For example, after playing the geometry questline, in which students complete partially drawn scale maps of an area of ruins, the teacher might start the discussion asking students what ratios they set up to find the missing sides of the buildings. Students may have different strategies for this, some finding the ratio of building to drawing, and some finding the ratio of width to length. Both are interesting variations on the same method, but without the class discussion, students may never realize that there are other approaches than the one they used. Next teachers might ask a more open-ended question as a thought experiment, such as, “What would happen if the plans were not drawn to scale?” This is a perfect question for a discussion as there is no right answer, but students are challenged to bring in what they know about areas other than math. During game play people naturally tend to have some tunnel vision, so some guided reflection is required to connect the idea of ratios to architecture, engineering, or social studies. Finally, teachers could introduce some authentic materials into the discussion. If they show a model train or a map with a legend, they can challenge students to identify the scale and compare that to the scale of their Radix maps. Making connections in this way can help students broaden their view of mathematical applications, as well as strengthen their conceptual understanding of scale at various order of magnitude. Teachers can also explicitly make students aware of the skills they have used, such as modeling or estimating, bringing in a layer of metacognition to their learning experience. As illustrated, there is a lot of value in whole-class discussions. Yet it is not a format that enables a teacher to hear from every student equally. One Radix teacher wanted a format that could help her assess each student’s understanding of the evolution quests she had assigned, so she decided to use a journal entry task. This is a very simple method that many teachers already use, and it is also perhaps one of the most useful when questions are carefully crafted. After her students had played through the menji questline involving different distributions of menji traits in different regions, this teacher wanted them to apply the concept of natural selection to a new situation. To scaffold the experience and retain the clear connection to Radix, she kept the question about menjis but added a new context. She asked the students to predict what would happen to the population of a group of menjis that moved from the forest to a dark cave. This is a good inquiry-based question in that there is no right answer, so whatever the students come up with has to be supported with evidence from what they have learned in Radix or other parts of their biology class. Some students said the menjis would improve their sense of smell, and others said they would adapt their vision to see in the dark. Regardless of the outcome, their teacher was looking for key elements in their answer, such as an explanation of the selection pressure involved, and a mention of the time scale over which this might happen. Building on the context set up in the game gave her a good way to conduct formative assessment in the middle of the evolution unit. It also gave her feedback on where she needed to draw explicit connections back to what students saw and did in Radix. For her, assigning a question that started with the game content but extended out was an ideal level of challenge for her students. Another way in which bridging activities can help complete an experience with Radix is by taking an abstract embodiment of a concept in the game and helping students discover what that same concept looks like in a formal academic setting. The algebra marketplace is a perfect example of a questline that makes people wonder where the math was after playing it. This is because there are no traditional math problems or equations that appear in the marketplace, so many players feel as if they are just trading goods. Players using the bartering system are in fact doing mathematical reasoning but it is also important for them to be able to express their methods with math symbols. So, one useful bridge activity is to show two vendors’ offers and ask students how they could determine which one has a better deal. To do this, students will end up writing equations such as 5s = 3t, where s is a snipsnap and t is a torrac. They can then replace the variables with values from the broker, or with other equivalent goods based on the vendors’ offerings. After students go through some of this, making their own meaning of the equations, they will eventually realize that these equations and variables aren’t so different from the ones they use in their textbooks and worksheets. This is when teachers can drive home the point that equations are not just right or wrong answers on a test, but they are actually a useful tool we can use to communicate and solve optimization problems like the ones encountered in the market. In this case, neither putting the equations into the game, nor bringing the market into the real world, would work quite as well as having two separate experiences and then making a connection between the two. We can’t expect students to spontaneously make these connections on their own, but by planning and facilitating a bridging exercise, teachers can create a learning experience that will stick. For teachers that have more flexibility or time in their curricula, there are even more constructivist and project-based activities that can effectively build off a game like Radix. They could have their students work through the ecosystem quests, constructing food webs and analyzing the ecosystem simulation tool, afterwards using a tool like StarLogo to create their own food web simulation to respond to different events. Students that have played the human body questline could extend the diagnosis tool by researching real afflictions and adding them to the game’s Big Book of Diseases. Students could even design a Radix-inspired educational game to teach the same concepts to younger students in their school. Whatever the activity is, it should help students make their own connections from game content to other school content, or from game content to their everyday lives. And it should help them reflect explicitly on what they are learning and how they are learning it. When creating games for deep learning, we cannot assume that players will learn without a teacher, but we also cannot assume that they will learn simply by having a teacher there. What teachers do with the game and how they do it is of utmost importance and must be as carefully designed as the game itself. An inquiry-based game must be supported by a culture of inquiry in the surrounding educational setting. The expectations set outside the game influence players’ sense of ownership and motivation inside the game. In a classroom with an existing culture of inquiry, students have the time and space to try, fail, and figure things out for themselves in a game. They ask each other questions and consult outside resources. The teacher stands back but offers resources, conceptual help, and encouragement. In a more teacher-centered classroom, students continually ask for clarification on what to do and whether they’re doing it right, and teachers are compelled to answer everyone individually. As a result the teacher is often overwhelmed and underprepared, and everyone involved gets frustrated with the process. Inquiry-based learning is built around the idea of learners identifying their own interests, asking questions they want to explore, and then conducting activities independently to construct their own knowledge of the topic. Skilled inquiry teachers act as facilitators in the process of synthesizing knowledge and solving problems in an open-ended educational space. Although Radix was designed to create a space that fosters inquiry learning and exploration, a completely open-ended game would leave players confused about where to start and what to work on. Therefore, game designers aimed to strike a balance between directed quests and open-ended experimentation. In many quests, this means that a problem is presented to the player, and a question is posed. Often the game goes so far as to suggest a tool that may be useful in solving the problem, and players are aware of what type of artifact they are expected to turn in. As for what to do and how to solve the problem, though, players are on their own to experiment and see what works before ultimately settling on a solution. This creates a space for inquiry activities that may take some students outside their comfort zone, but provides the opportunity for authentic discovery and problem solving. Another game that does a good job of creating an inquiry experience in a digital space is Portal. Portal consists of a series of puzzles in which players must use a portal gun to create portals between flat planes laid out in a test chamber. Because momentum is retained while traveling through the portals, players must experiment to figure out what trajectory will help them reach their goals. While the room design and the tool available create constraints, players can create portals anywhere, and they must experiment to see what happens while figuring out how the world works. Digital games, as designed and programmed experiences, by definition have constraints and directed goals. In a good inquiry game, these bounds work as scaffolding to help the player understand what they can try and where they can push those bounds. Players usually have an expectation of independent experimentation and repeated failure along the way to success. There is situated feedback, but no one telling them exactly what to do, which creates a feeling of ownership and satisfaction when they figure out for themselves how to complete a level. The preexisting expectation that you will have to figure out how to use portals by experimenting is key to a player’s enjoyment and success in the game. Unfortunately for games designed for in-school use, this expectation does not often exist in the classroom. The most prevalent teaching methods consist of a teacher who has the knowledge, students who are supposed to follow instructions, and problems that have right answers. This is true for textbooks, worksheets, and even many science labs done in schools. Because this is the norm, students and teachers both bring certain assumptions with them even when implementing an inquiry-based game like Radix. What can happen in this situation is that when students are presented with a challenge in the game, their first response is to ask the teacher, “What do I do now?” and “Am I doing this right?” In turn, the teacher, who is used to the role of dispensing knowledge, feels responsible for answering all her students’ questions and looking over their shoulders to check their work. In a large class full of students playing a game in different ways and at different stages, keeping track in this way is not feasible and, more importantly, counterproductive. Trying to fit an inquiry activity into a didactic frame is doing a disservice to everyone involved, because the tasks at hand will feel incredibly frustrating, and no one will reap the benefits of independent exploration. The key point here, though, is that we can’t fault the students for trying to follow directions as they’ve been taught. Nor can we fault the teacher for trying to answer students’ questions and help them along the way. These are behaviors that are so ingrained because of the classroom culture that we all grew up learning in. It’s what we’re used to, and it’s not easy to change years of those practices. Nonetheless, there are ways to overcome these challenges and prepare learners for an inquiry experience. For example, Kolodner and colleagues (2003) describe how they create a culture of collaboration, independence, and scientific reasoning in the Learning by Design curriculum. This was an approach to middle school science learning designed by researchers and learning scientists who worked to address some of the big challenges in classroom inquiry learning. Before delving into the inquiry-based science activities, they designed “launcher” units in which students watched professionals engage in scientific practices involved in problem solving. The students worked together to identify the investigation, argumentation, and other practices the experts were doing, which helped create community and acclimate students to new classroom norms. After that, the designers worked to “ritualize” sequences of activities to make them come more naturally to the students, such as designing an experiment, then running it, and finally reporting on it. Making these science practices explicit and recognizing when they were occurring helped students understand what was expected of them in the class and as a community. These methods were implemented in the Learning by Design project to prepare students for design challenges and construction tasks. Although the Radix project was centered on a video game, both involved curriculum that allowed students to take ownership of their own learning. As we have seen, simply providing that type of opportunity does not automatically change the expectations of the people interacting with the intervention. That must be done over time and with intentional changes to the classroom culture and conversation. To bring about this kind of cultural shift in Radix classrooms, our first step is to make teachers aware of the difference in approaches so that they know what to look out for. They do so many things unconsciously, such as standing in front of the classroom to explain something, or giving an answer because it’s the fastest way to impart information. Bringing these actions to the front of their minds helps them notice the ways in which they create a didactic classroom culture. The next step is for teachers to explicitly tell their students that during Radix game play, learning may feel different, and they may not get the answers they want right away. Some students like this idea, and some don’t, but they appreciate being told up front what’s going to change. Finally, teachers can use some specific strategies to promote inquiry. A teacher in one Radix school we worked with had a “Three Before Me” policy. Any time a student had a question, they were not allowed to ask the teacher until they had consulted three other sources. These could be fellow students, the Internet, or the class wiki, for example. When they came up to the teacher, he would ask them to explain which three sources they had already tried. By being consistent with this policy, the teacher helped his students know what to expect, and they got used to giving each other more advice. In addition, this teacher acknowledged his students’ frustrations and talked to them honestly. When they were stuck on a quest, he would tell them that getting stuck was part of the learning process, remind them about the last time they had figured a problem out, and encourage them to keep going. Gradually over the course of a semester, students got used to the change in expectations and came to enjoy the independence of figuring out how to use the world map or build a perfectly sized animal pen. They felt a strong sense of accomplishment each time they turned in an object they had created, and they were quick to give each other help and encouragement. Radix became almost like a club that everyone in this teacher’s classes was a part of. This case demonstrates the strong community that can be built around a common experience of a game like Radix when the game’s approach and classroom culture support each other. When implementing an inquiry-based game that is different from the activities usually done in schools, some amount of disconnect between the old and new approaches is inevitable. That disconnect is not to be feared, however, but rather a motivation to analyze the existing classroom dynamic and an opportunity to purposefully make changes. In fact, Radix can be seen as an on-ramp to more general inquiry-learning techniques, as it provides an entry point for teachers to change specific aspects of their practice, giving them a focus as they get a feel for the role of an inquiry facilitator. The task of making changes and moving the needle in this area is not just for the teacher, but should also involve the game designers and curriculum developers. Designing an amazing inquiry-based game is not enough to be successful in an actual classroom. In addition, we must work to design the classroom culture that will support the game’s approach and help players flourish in and out of the game world. School districts and other educational systems must be taken into consideration in the design of any game that will function within those systems. Games that are designed thoughtfully and flexibly will be more accessible and easily adopted. Resonant games used in a school system that is amenable to new pedagogies, or by a teacher who is able to patiently adapt to the constraints, will have the foundation needed to build an engaging learning experience. These can result in examples of successful implementations to be used as models for other locations and users. Implementing resonant games in a school system that is not supportive, whether it be technology support, administrative vision, or parental expectations, can be a losing battle. Teachers can end up spending their limited time defending the intervention, which means less time for lesson planning and design, leading to a less successful implementation. It’s easy to see how the design of a game and the design of its implementation create an educational experience for students. What may be a bit less obvious is how the design of the preexisting school system can support or hinder that educational experience. School systems go beyond the classroom and beyond the school, shaped by policies and decisions at the district level. In fact, they go beyond the district level to the national culture and history of education, which has a huge impact on the expectations of teachers, administrators, and parents. These spheres of influence are present in all types of educational settings, from public schools to private schools, home schools and afterschool programs, though the specific challenges and opportunities that arise may vary greatly between those settings. Although Radix has been used in all types of learning environments, we focus here on public schools because they make up the bulk of our Radix users, and they are where resonant games can have the most impact. When implementing an innovative pedagogy, we must work within several constraints, and while those vary by schools, districts, states, and so forth, some common themes emerge. For digital interventions, technology is often a major barrier, and not just whether a school has enough working computers. Teachers may have trouble booking the computer lab or laptop cart during the week they want to cover a certain topic and often have no access during computer testing months. There may not be reliable Internet or enough bandwidth. Teachers are often restricted from downloading software or plugins they need, and IT staff are spread so thin the school year may be half over by the time they get to it. Websites may be blacklisted or necessary ports may be blocked, with control over that residing at a district-level office. The distribution and management of technology in schools has grown into a complex system unto itself, and these issues can often result in a teacher ending up with limited seats or no connectivity when students show up for class. This can be mitigated in the design of the game by providing meaningful ways for students to share a computer and game account. It can be mitigated in the design of the implementation by helping teachers prepare backup activities that take game content offline or expand on it in a whole-class activity. These are some of the strategies we used with Radix teachers, but the frustrations around technology are bound to be there. Despite these barriers, more and more schools are starting one-to-one initiatives, which means teachers are looking for good content and innovative ways to use the computers. This opens up the doors to not only use new software, but also bring in new pedagogy and skills, which presents a valuable opportunity for games not previously adopted in classrooms. Another challenge for inquiry-based or skills-based resonant games is the lack of understanding of the value of games and student-centered learning. This stems from the cultural beliefs our society holds about what does and does not constitute good learning. In many people’s eyes, learning happens when a teacher imparts information and assigns concrete tasks. This is how learning has been structured in our culture for decades, and as a result, it is the format that people are comfortable with and expect to see. Video games, on the other hand, are often seen as frivolous or indulgent, wastes of time, or just for fun, with no real value. Again, this is because the role of games in general and video games specifically has developed this way in popular culture, and most people don’t yet understand the powerful educational potential of games. Both parents and administrators are some of the key stakeholders in a school system that are likely to have these expectations. Many students hold similar beliefs, however, whether consciously or unconsciously. Students that have been comfortable in the traditional learner role throughout their school careers can be just as resistant to change as the older generation. We’ve heard from students who said they didn’t want to play Radix and would rather just stick to book work because they don’t have to think so hard—they can just do the work, and it’s done. This sentiment has been echoed among multiple students because it feels easier to keep doing what they know how to do, and because change is hard. Though difficult, one of the best ways we found to combat this with Radix is to show people firsthand how transformative a game experience can be. Let administrators or reluctant teachers watch a class playing Radix so that they can see the “aha” moments and the lively chatter that accompanies the game. Take students far enough into the game that they get drawn in by the rich world, the social experience, or whatever aspect ends up motivating them. Show parents that their children have actually learned from a game, and that they have done it willingly. It takes work to make these live examples happen, but they are the most powerful evidence we can show for the value of inquiry-based learning in games. Perhaps the biggest barrier to embedding games into classroom curriculum is the combination of imposed standards and limited time. The people who write educational standards mean well, and in theory the standards make sense—a consistent set of skills and knowledge that we as a society agree are important to learn. Many of the new standards, such as Common Core and NGSS, even include skills and practices specific to the disciplines. All align perfectly well with a digital game, which can include both content and skills in its design, and Radix is a good example of this. The problem comes with the amount of content allotted for a given school year, and the testing that goes along with it. Even with standards like the NGSS in place, which don’t actually cover as much domain-specific content, the textbooks and assessments being used are still very content focused and tend to drive the curricular goals. What we know how to test at this point is procedural content knowledge, and with limited time in the school year, teachers know they have to teach to the test. Assessments in the United States are a complex and rigid system, and we won’t go into those details here, but it means that more authentic but generalized practices such as independent thinking, modeling, or collaboration often fall by the wayside. Teachers and administrators believe those skills are important, but they are not assigned a value within the system of schooling. The approach we’ve taken in Radix and other projects is to design a game that covers the shallower content necessary in schools, but that also builds in activities that foster deeper thinking. This “content as cover” (Klopfer, 2008) approach has seen some success, especially in teachers who recognize the importance of inquiry. In that sense, resonant games can be a good entry into schools by incorporating both types of learning in one intervention. Some of the learning experiences essential to inquiry, however, necessarily take significant amounts of time. Students need to wrap their minds around a question and try several different solutions before they devise a successful one. They need time to confer with each other, build on the ideas of their peers, and iterate on their projects. In Radix students could certainly save time by following step-by-step instructions on what to collect, what to breed, and how to complete a quest—but they would be missing out on the very pieces that give them ownership of the learning process. Inquiry-based learning is not an efficient method in terms of time, so it can be very challenging to fit the processes into discrete class periods or to fit the projects into a packed syllabus. Where we saw big successes with Radix were with teachers willing to give up class periods to game play and discussion and to put aside some of the standards to provide something they saw as more meaningful. Working within the system in this way is very difficult, and given the demands on teachers’ time and class time, this is not something that all teachers can do. So until larger systemic change can be brought about, teachers are left to manage at the classroom level. Schools, what they teach, how they teach it, and the interactions among stakeholders, make for complicated and hard-to-change systems. In designing games that will be embedded in those systems, it is essential to be aware of the barriers the game will face, as well as the opportunities it can capitalize on. It is useful to identify the goals of the game and its implementation, and pinpoint where those may differ from the goals of the school or school system. By being aware of what the challenges are, you can design for them as much as possible both in the game and in the implementation, finding areas where the game can be molded to fit the current educational landscape. This will help the game find success in today’s classrooms. Nonetheless, as educational game designers, we also have a larger goal of working to change expectations and demands at the system level. One way to move incrementally toward that goal is to continue making and implementing deep learning games that can work in schools. As more stakeholders become aware of the value of alternative pedagogies and more practitioners become adept at utilizing them, the ecosystem will in turn evolve into a more friendly place for students to have those learning experiences. Teachers using innovative games that involve alternative pedagogies need training, support, and access to peer communities to effectively implement those games. Teachers that have access to quality and ongoing professional development will start with a stronger understanding of how to implement a resonant game and will have the tools to continue improving their own implementation. Teacher communities provide a venue for sharing experiences and advice, making new pedagogies feel more accessible and attainable. Teachers implementing resonant games without a professional development experience or the opportunity to learn from other teachers often miss the mark on elements of an implementation that are important to foster. They are certainly still capable of using the game, but they often wonder why it didn’t work out as they envisioned or why students aren’t engaged. When an Olympic tennis player traverses the court, wielding her racket effortlessly, she makes the sport look easy. That’s because she has a passion for the game, but what you don’t see are the years of practice and all the people supporting her behind the scenes. Olympic athletes have coaches, trainers, dieticians, and managers, not to mention supportive friends, family, and fans. This support enables a tennis player to learn to use the tools she has on the court and become an expert. You can be sure the first time someone handed her a racket, she wasn’t using it to serve a ball at two hundred kilometers per hour. In many ways, teaching in general, and teaching with resonant games in particular, should be thought of similarly. The first time you give a teacher a complex game, no matter how well designed, he can’t be expected to implement it expertly. He needs to have a year or more of implementing the game, getting a feel for what works and what doesn’t, before he will start to really feel comfortable in that arena. He also needs those coaches and trainers—perhaps not as numerous as the Olympian, but he needs people who are experts in learning games to tell him what’s important and what isn’t, and to provide an objective lens on what changes he could make to his technique. Finally, he needs supporters, often in the form of fellow teachers going through the same learning process, but also in the form of administrators who are providing resources and space to experiment, and who are putting the word out that those game-play experiences are valued. Teaching with games is a skill that should be developed like any other, and in the education ecosystem, the necessary training and support often comes in the form of professional development (PD). Teacher PD sessions can come in many forms, and Radix drew on several approaches to support teachers interested in implementing the game in their classrooms. We had groups of teachers come to our offices to participate in day-long training sessions. We offered to conduct sessions on-site for schools that had groups of committed teachers. We held monthly webinars and office hours for teachers to get advice from Radix staff as well as other teachers. In addition, many of the resources and recordings from these sessions were available online. Some of the sessions covered the basics of how to play the game, set up classes, and use the tools and resources available. Other sessions went more deeply into conducting transfer activities and thoughtfully designing a Radix implementation. All the sessions focused on inquiry learning in a game and how to create a classroom culture conducive to that type of learning. We wanted to make it clear to teachers that it was okay to not have all the answers, and to encourage them to guide their students to other resources. As this is not a role that teachers are all used to taking on, we knew it was a big part of developing their skill in facilitating learning games. Despite this being new to many teachers, most of them can understand the value of it theoretically. Actually becoming a facilitator, however, rather than simply a director in the classroom was much more difficult. That part took ongoing time, encouragement, and feedback. In a few cases, as part of our research study, we even had the opportunity to give a teacher a live demo of what an inquiry-based classroom could look like with her students. This really gave teachers a concrete picture of what it should look like and how their own students could respond and change given the opportunity to take the lead. Although doing this one on one is certainly not scalable, it is a model to inspire PD design, whether it be connecting expert game-based teachers with novices, or simply providing video resources of model Radix classes. The key is to simultaneously show teachers what a successful Radix implementation can look like and give them the time and space to experiment and practice their craft. Another wonderful professional development resource for teachers is other teachers. In some cases, it may be teachers who have used a tool or approach already, but it can also be fellow teachers who are going through the learning process at the same time. To extend the Radix PD past the formally organized sessions, we set up an online discussion forum for teachers to ask questions and exchange ideas. Here they could ask about where to find things in the game, clarify biological concepts, or share extension activities they found successful. This was the type of online community that we had hoped to grow among the Radix user base. Online communities can be difficult to foster, however, especially within a group that is pressed for time and not always comfortable with online tools. The Radix teacher forums didn’t get a lot of momentum going within the pilot year, but this area could be further designed and grown into a valuable resource. This is generally true for many of our more traditional forms of PD—as a program gets more refined and systematic in how it’s run, and participants become increasingly comfortable in online communities, we can bring more and more of the PD opportunities into the online space. In terms of community, what we did see on a smaller scale was teachers interacting within schools, where there were multiple teachers using Radix. In these situations, teachers did troubleshoot and plan lessons together, and they found it immensely helpful, not to mention more enjoyable! In one case, two science teachers even created their own Radix wiki as a resource for their students. In that school, what started out as a small community of Radix teachers generated excitement and grew into an active community for all students playing the game. This is much harder to create when there is only one teacher implementing something new. It also greatly benefits from including administrators in the community. Involving science coaches, curriculum chairs, or even principals in the PD sessions, or inviting them into the classroom on Radix days are a couple of ways to get them on board with a shared vision of new approaches to teaching. Support from those administrators can make adopting a new teaching tool feel more accessible, and it contributes to the excitement of a new initiative in a school, which is key for the sustained motivation of both teachers and students. Creating a community around an educational game that includes students, teachers, and admins, where they all feel a part of something bigger than their own classrooms, is a huge step toward normalizing the use of complex learning games in schools. The more people in a school using a tool and talking about what went on in their classrooms, the more others will see the value and feel motivated to try it. This way the community continues to grow within and among schools, leading to more adoption and further improved teaching practices. The principles described in this chapter emerged as key design principles in two ways. We had many of them in mind at the outset, when we began designing the game that would come to be called Radix. These principles and many more guided our design, prototyping, and play-testing work in the development phase. In addition, many of the principles emerged as we began to see teachers using Radix in myriad ways “in the wild” of their classrooms. Observing Radix sessions and talking to teachers about what they saw working well and what they struggled with helped us solidify these most influential principles in implementation design. Note that none of these elements are all or nothing—every piece of the game and each implementation can be placed along a spectrum of embodying the concept in the principle. Throughout the Radix design process and pilot year, we saw instances of every combination of these principles. There are seven topic areas in Radix, and in an ideal world, we would have designed and developed them all equally, but in reality, some quests are more inquiry based than others, and some tools foster more social experiences than others. Teachers’ understanding of inquiry and their ability to attend PD varies for many reasons, and the Radix pilot only followed them in their first year of implementation. Different states have varying levels of technology infrastructure and are adopting standards in different ways. These are just some of the reasons for the wide variation we have seen. While we present these principles as ideals, in reality teachers each have their own goals for implementation, and the right amount of each element varies depending on the setting and learning objectives in a particular classroom. Finding the balance that is right for each game and each implementation, and understanding how these elements interact with each other, is where the real design work comes into play. Some teachers who implemented Radix saw it as mainly fluff rather than serious content. Other teachers used it directly to teach evolution or genetics. And some teachers weren’t looking for content at all and only wanted to provide a self-directed inquiry experience, with math content as a bonus. In some cases, teachers felt the game worked great in their classrooms, but as designers, we thought it wasn’t living up to its potential. And teachers who felt frustrated and thought the game was a dud might have had a completely different experience given one or two small tweaks to their approach. This wide variety of user experiences is inherent to a resonant game with rich content and opportunities for deep learning. When designing a resonant game, and evaluating its success in the wild, we must understand the need for the complete package—that is, how the execution of all these principles work together to nurture that delicate plant of inquiry and create opportunities for deep learning. In many cases, simply having each element present is not enough; we must also understand how they affect each other and how the seed is planted to begin with. A teacher who creates a classroom culture of inquiry and freedom is setting the stage for students to explore the meaningful systems embedded in a game. The exploration of those systems results in learning through a teacher’s skillful implementation of bridge curriculum that makes important connections visible. Teachers get better at doing this over time with the help of practitioner communities and professional development. And they are supported (or challenged) in their endeavors by the educational system they function within. Each principle has a relationship with the other principles, and with many more not discussed explicitly here. With certain elements missing, the package is not complete, and learning may not be supported to its fullest potential. But with each piece in place to support the others, the impact of the core game experience is amplified to the point where it can create connections never imagined by the original designers. These are not plug-and-play games for which an educator can read a teacher’s guide and use it the same way teachers across the country are using it. The ability to weave offline and online, in-class and out-of-class learning experiences together is part of the inherent value of a resonant game, but it also requires a commitment to the pedagogy. The design principles presented in this chapter can be applied to support that pedagogy, and they can be used on a wide array of games big and small. Considering these aspects will help embed exploration into the game and embed the game into the system it must function within. It will also help make the game resonate with classwork and the outside world, connections that are of the utmost importance for deep learning. This design process takes hard work on the part of the game designers, curriculum designers, practitioners, and even players, but when all the elements come together, it can be an unforgettable learning experience for everyone involved.